KOAMTAC Extended Battery and Pistol Grip Companions extend battery life and improve ergonomics. Ensuring we meet our customer’s demands is always our top priority; they wanted long battery life and a gun-style scanner in the KOAMTAC familysmartphoneso we made sure to give that to them. 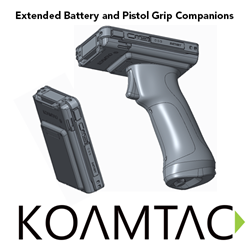 KOAMTAC, Inc., a leading manufacturer of Bluetooth® barcode scanners, RFID readers, and mobile point of sale (mPOS) companions introduces the Extended Battery and Pistol Grip Companions. The Extended Battery Companion will attach directly to a smart device using a KOAMTAC custom case. It can also be added to KOAMTAC’s KDC470 or KDC475 for extra long life of the connected smart device and scanner while barcode or RFID scanning for inventory, ticket validation, or field services. The Extended Battery Companion contains a 2000mAh battery, an LED indicator light, and security hand strap. The Pistol Grip Companion attaches directly to the KDC470 or KDC475 to enhance the ergonomics of the scanner and increase comfortability for individuals accustomed to gun-style barcode scanners. The Pistol Grip Companion comes complete with a 6000mAh battery to ensure lasting power as well as LED indicator lights for charging and discharging. “Ensuring we meet our customer’s demands is always our top priority; they wanted long battery life and a gun-style scanner in the KOAMTAC family so we made sure to give that to them. The next logical step was to create an Extended Battery for smart devices that stands alone from our scanners to continue expanding our portfolio of accessories beyond data collection,” said Hanjin Lee, President/CEO. The Extended Battery and Pistol Grip Companions can be charged, along with the KDC470 or KDC475, and your smart device using either a micro-USB cable or via KOAMTAC Charging Cradle. The Charging Cradles come in 1-slot or 4-slot varieties to suit any size business. The new Extended Battery and Pistol Grip Companions can be purchased directly through the KOAMTAC store or from resellers and comes complete with unparalleled customer service.